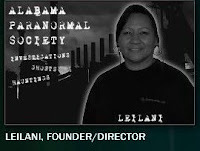 Last night I was lucky enough to meet with Leilani from the Alabama Paranormal Society. 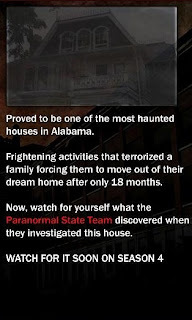 The Alabama Paranormal Society is one of many ghost hunting groups that works with the team from Paranormal State, the television series that airs on A & E.
Leilani is the founder of Alabama Paranormal Society and she is also a psychic. She is also a very friendly woman and she did a wonderful interview with me in which she described her recend investigation of a house just East of Birmingham. Her team's investigation of this house is part of season 4 of Paranormal State. I was thrilled to get a chance to talk to her about her exciting investigation of this incredibly haunted house that she says is the most haunted house she has ever been in. Another psychic that had visited the house was also present during the interview. Her name was Judi Lynch. Judi Lynch said that as she drove up to the house she heard screaming come from the house. The negative energy coming from this house was so strong, she had to sit in the car for a while before she could enter the house. Leilani describes the house as literally throbbing when she walked towards it. She had never seen anything like it. The house belongs to the mining period in Alabama history in which powerful mines and mills created little communites of workers. The owner of the beautiful mansion at the time of it's construction was one of the engineers working in the mill. In fact, one of the first indications that the house was haunted was when the family that currently owns the home began renovations, they had the entire house rewired. A few days later they returned to the house to find all the wiring redone to its original configuration. Leilani says that she had a very strong feeling that the hostile spirit in this house was the engineer who used to live there. Leilani described many of the terrifying things that happened at this house to me. She described the spirit leaving scratch marks on one of her investigators. At one point, the spirit ripped a stained glass window from its metal hangings and sent it flying towards Leilani. At another point, it knocked the tripod over. During the investigation, they were able to catch footage of the black spirit moving slowly across the room and then darting into the next room. When the spirit moved, it set off the motion detector. Leilani also said this is one of the rare houses that actually scared her. The activity in this house was so violent and so malevolent that the family who owns it was forced to flee after only living there 18 months. They currently live in a much smaller house and use the big house only for storage because they are too terrified of the house to go back there for more than a few minutes. That story gave me chills. Nice interview...that is one house you will not catch this gal going inside...yikes! FANTASTIC interview, Jessica! I don't watch Paranormal State but I really found the conversation you had with Leilani and the info she related to you fascinating. Very cool!